When: Saturday, Nov. 17, 2012 from 10 a.m. to 3 p.m. Thanks to sponsors, admission and parking are free and tote bags will be given as a gift while supplies last. Enjoy the day exploring and learning about the natural environment of southwest Florida. The festival will once again be filled with activities and exhibits for people of all ages to enjoy, including more than 50 nature exhibits, the Mote mobile exhibit touch tank and guided walks. 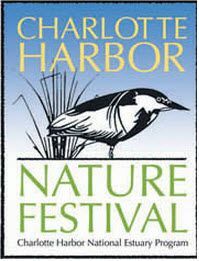 (Charlotte County will hold a trail run prior to the festival.) The children's Discovery Zone will be packed with games and activities, including a fossil dig. Children will also learn about fish and fishing and then receive a free fishing pole (one/child) while supplies last. Information on sustainable products will be provided this year. Refreshments and lunch will be available for purchase. The festival is organized and supported by a dedicated group of volunteers representing a diverse group of organizations, associations, businesses and agencies. It has remained free to the public due to the generous support of sponsors and proceeds from a raffle held at the festival.